> Charlotte's Quest is born! Deepnight : OK, so are we making a shoot'em up? Hiko : Euh... OK - Ellon In The Dark part 2. Ellon is lost in one of his shady dreams, and his sister comes to find him. Her bedroom crash lands in a nightmare, and she has to kill all the monsters with love hearts and a unicorn! Deepnight : Any ideas for the hero? Charlotte : Me! Me! Me!!! Charlotte : Yeeeeaaaah!!!! Too cool! I'm going to be a super hero in another game!! 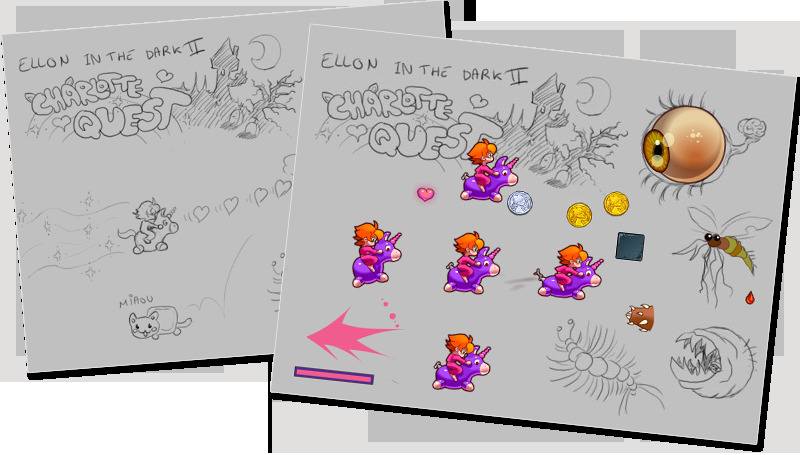 Hiko : Ellon In The Dark 2: Charlotte's Quest. Deepnight : Perfect! Let's do it! A fabulous new game is now under development, keep up-to-date to see how it turns out!